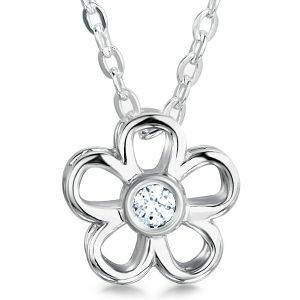 Pretty and beautifully crafted 0.10cts round brilliant cut Daisy pendant, with flower design supplied with 18 inch chain. A solitaire Round Brilliant cut Diamond is displayed within this adorable daisy styled pendant. The Brilliant cut Diamond is 3mm in diameter, weighs a total 0.10 carats and has been graded SI1 Clarity and G Colour prior to being expertly set within the bezel setting. The delicate pendant comes complete with an 18 inch chain, which passes through the body of the pendant and can be finished in 18 Carat White or Yellow Gold and 950 Platinum. This deceptively simple pendant is crafted to order so please allow up to 4 weeks for delivery. Upon completion the pendant will arrive to you beautifully packaged, ready for that special occasion.